Written by Charles Busch; directed by Carl Andress. Soho Playhouse 15 Vandam Street, New York, NY. Opened Sept 22, 2010; closes May 1, 2011. Reviewed by Lucy Komisar March 26, 2011. Charles Busch's very funny campy satire of Catholic nuns hits all the bases, extending to a stereotypical Jewish philanthropist, a "Da Vinci Code" style mystery with a German faux-nun and a brown-robbed monk, and even a detour back to thirties movies about diligent good-guy reporters. 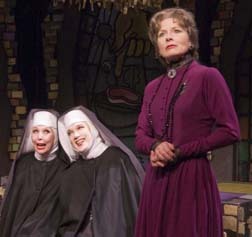 Julie Halson as Sister Acacius, Charles Busch as Mother Superior, Jennifer Van Dyck as Mrs. Levinson. Photo by David Rodgers. You know when you see most Busch oeuvres that they will be over the top. ("The Allergist's Wife" was an exception.) So suspend belief here, don't' look for high art, and you will enjoy every minute. Thanks in equal measure to director Carl Andress who knows how to play with fantasy. A school run by Mother Superior (perfectly channeled by Busch) is in financial troubles. Who else to turn to but Margaret Levinson (the excellent Jennifer Van Dyck), a philanthropic Philadelphia Jew? But she is an atheist! She thinks God is a fairy tale. Van Dyck is rigidly "upper," snatched from the new Wall Street Journal society pages which would appreciate her love of designer clothes. On safari in Crete, she wore a Bill Blass jacket. When there are remarks about her being born in a stetl, she retorts that her father was presented at the British court. 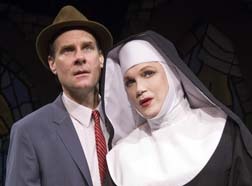 Alison Frasesr as Sister Walburga and Jonathan Walker as Brother Venerius. Photo by David Rodgers. And there is also the young postulate Agnes (wide-eyed Amy Rutberg) who lays on hands and makes medical miracles and also belts out a pretty good soprano. She has visions inspired by the urine on a pair of underpants she has obtained, and her hands bleed from stigmata, though that turns out to be the juice of crushed cherries. Into this weird collection comes Jeremy (Walker, who steps out of the era) a former reporter now working for a film company that wants to sign young miracle-making Agnes. 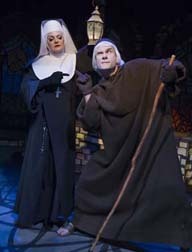 Jonathan Walker as Jeremy and Charles Busch as Mother Superior. Photo by David Rodgers. But the plot thickens. It seems that Sister Acacius (the tough Jule Halston), a Brooklyn-accented nun, and Jeremy were once reporters together. Mother Superior will deal with that. I loved this wonderful over-the-top camp, with lines like, "We are living in a time of great social change. We have to stop it!" Of course, the Messiah was a woman, and the ensemble cast presides elegantly over such tongue-in-cheek revelations. This play joins the cannon of Charles Busch's hysterically funny satires. Definitely worth a trip to Soho.